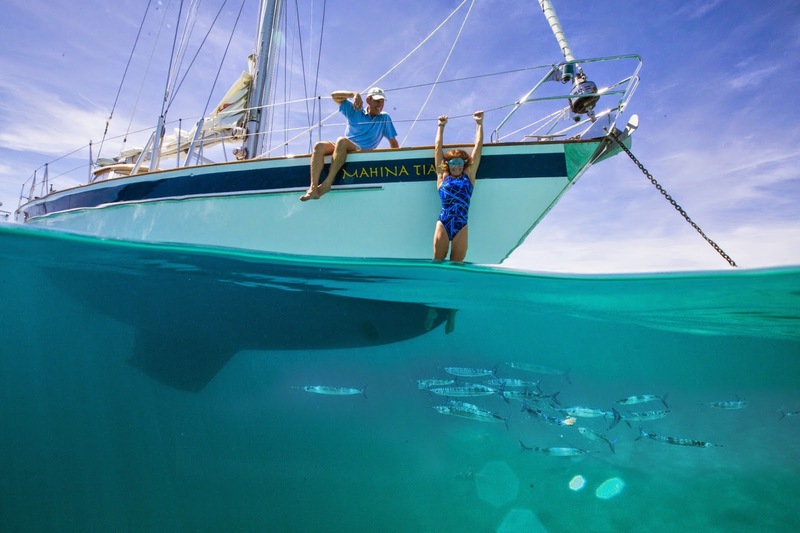 John and Amanda Neal are not your average sailing couple. At first glance, they look like any other pair of cruisers you'd see at a dockside pot luck; good looks, sun-kissed skin, Hawaiian shirts and easy smiles. 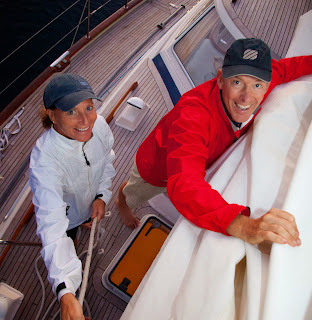 You'd never guess that they are bonafide modern-day adventurers and incredibly accomplished sailors who have literally sailed circles around the vast majority of us. I met them last January and they are as unassuming as could be. But don't be fooled, they are anything but "normal". Having logged over 600,000 miles between them, it's hard to tell based on numbers and stats alone who is the 'saltier' of the two. At the tender age of 22, John took the helm of his 27 foot sloop and singlehanded from the Marquesas to Samoa (4000 miles) and wrote a best selling book about it. As a teen, Amanda sailed from New Zealand to Vancouver with her parents and in 1990 she completed The Whitbread Around the World Race (now The Volvo Race) as rigger aboard s/v Maiden, the first all-women Whitbread boat. Individually, their resumes are impressive and together they complete the dynamic duo behind Mahina Expeditions; the hard-core, hands-on, live-aboard sail training school that takes place in waters that most sailors only dream of. 1. They say the #1 rule of cruising is to not have a schedule, yet you run a successful offshore sailing school that requires one which I imagine must be stressful at times. How hard is it to plan your itineraries and stick to them? It isn’t hard at all. I spend a lot of time researching the routes plus I’ve sailed most of them several times over the past 40 years and have a fairly good idea of what to expect, weather wise. I also crank 30-50% extra time in to the plan, so if we need to wait for better conditions we can drop some places we would normally have stopped to explore. 2. You have done your fair share of sailing in both the big and little latitudes. Do you prefer one over the other? What stands out in your mind as the biggest difference between the two and what do you find the most challenging about high latitude sailing? We find the high latitudes more challenging, more difficult and more rewarding. 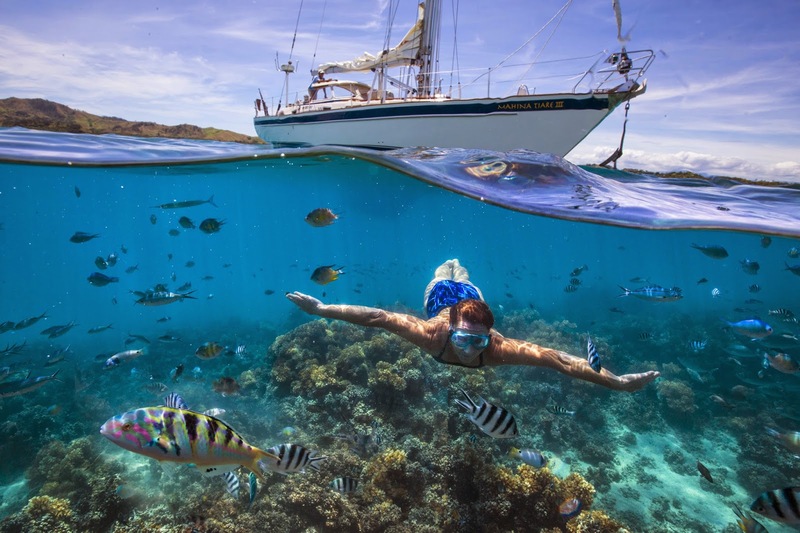 Tropical sailing is lovely, and when we’re in Patagonia or the Arctic getting knocked around and cold and wet, we sometimes say, “What are we, crazy? Remind me why we left the tropics for this abuse?” We don’t prefer one over the other. We’ve just left the South Pacific after five incredible, over-the-top years. It was quite sad leaving several countries, but we’re already looking forward to return, although probably not for several years. (The biggest difference is:) The stronger winds, substantially larger seas and faster speed of movement of the weather systems. For instance, nearly each of the 15 or so times we’ve made the 2700 mile passage from Auckland, New Zealand to Tahiti on the northern edge of the Roaring Forties we’ve seen 50-60 kts and very large seas. On this passage we find professional weather routing very valuable. 3. You do a lot of sailing instruction with people who are dreaming of taking the plunge into the live-aboard life. What would you say is the most common mistake or misconception your clients make/have when it comes to sailing/cruising? We frequently hear that folks find ocean passagemaking more physically demanding than expected and that their boats require substantially more time and money to maintain than anticipated. Another common mistake is waiting too long to reduce sail – which frequently results in damage to sails or rig. 4. Similarly, you do a lot of consulting with people to help them find the perfect cruising boat. What is the one piece of advice you would give to people shopping for a boat? Give yourself plenty of time to find, repair and outfit your boat. Currently, the selection in North America for good offshore-capable boats in the under $100K and under $200K categories is quite slim. Unless the seller has just spent a substantial amount of time and money upgrading and preparing their boat for offshore, the purchaser can easily spend 100% of purchase price and 1-2 years in repairing and outfitting for passage making. The older you are, the newer the boat you should purchase, even if it is smaller, if you really want to go cruising. 5. You and Amanda are both very skilled sailors with impressive resumes. What is one skill each of you possess that you found the most useful in regards to the cruising lifestyle? On the flip side, what is something you wish you were better at that would be helpful with life aboard? Amanda has an amazing situational awareness – when something breaks or there is a critical time, she can instantly figure out exactly what needs to be done and make repairs. I think this is partly a result of her extensive offshore racing background including completing the Whitbread Around the World Race as rigger aboard Maiden and surviving two hellacious Sydney-Hobart races in boats that slowly disintegrated. She wishes she had more interest in following the weather. I’ve found the ability to keep the big picture and plan ahead for everything helpful. Although we can both speak and understand basic French, I wish we had better language skills, particularly Spanish and Portuguese. 6. Amanda is a very accomplished racer turned cruiser. Many women who cruise are following their husband's dreams and a rare few are as competent on a voyaging boat as Amanda. What is a piece of advice she would give to other women who are looking to boost their confidence and/or sailing skills? Discover your learning style. Most women learn differently then men. Cruising World magazine commissioned me to write this four-part series of articles on women cruising. Take the learning at your own pace and keep it fun and enjoyable. Don’t beat yourself up if something goes wrong. Don’t forget to take time out for yourself and your own passions/interest, whether sewing, bird watching, dancing, reading, yoga, fitness or whatever. I often find the most interesting and happy cruising women are ones who take time to incorporate their own interests. 7. If you could give one piece of advice to people who are starting out cruising, what would it be? Get off your boat and explore every chance possible. Don’t let your boat become all-consuming. Follow your personal interests and passions while cruising. Use your skills and ingenuity to make a positive impact on the places you visit and people you meet. 8. You have made your life's passion (sailing/voyaging) your work. How do you not get "burned out"? We are never on the boat 12 months a year, and find most people who are, get burned out with cruising. We always plan ahead and find a safe place ashore to leave our boat during hurricane or winter storm season. As much as we love being on the boat, we’ve found it very healthy to have 4-5 month breaks each year. In the beginning it was because I’d always run out of money and need to head home to work for a few months. Now, even if we didn’t need to come back to work, we still would as we really appreciate the change of focus and pace. It’s a joy to catch up with friends and family and mentally stimulating to work, but by the time we head back to the boat, we are both really looking forward to it. 9. You sail on a Hallberg Rassy 46 (coincidentally our *dream* boat) - why did you choose her and if you could change one thing, what would it be? 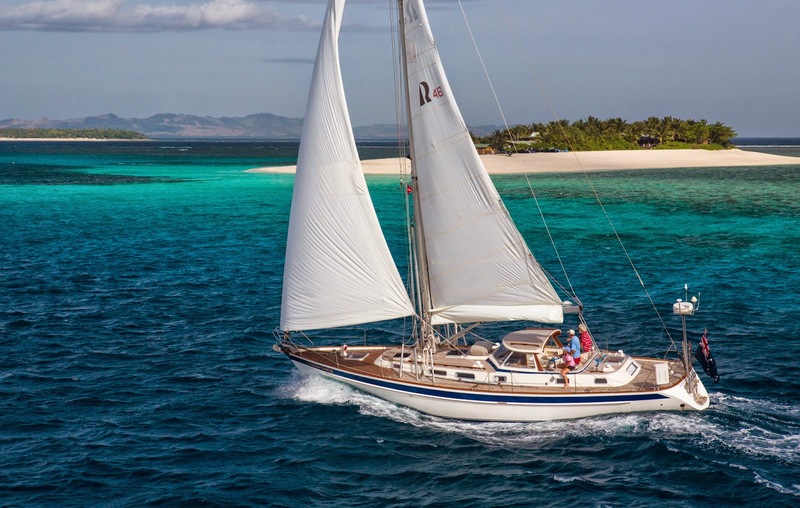 We looked worldwide for several years before ordering a Hallberg-Rassy 46. Some of our criteria: great sailing performance, protected helm position (the factory option of a permanent hard dodger is brilliant), substantial build quality as we sail in some fairly extreme weather conditions, extensive tankage (265 gallons water, 1400 mi range under power), simple and sturdy rig, moderate draft (6’1”) and tons of storage space. We’ve now sailed Mahina Tiare III 181,000 miles, the equivalent of seven times around the world and she is still in excellent condition. (For more, read John's review of the HR 46). The one thing we would change would be no teak decks. We tried to get HR to skip the teak decks, but as they’ve never built a boat over 34’ without teak decks, they have no non-skid pattern in the deck mold and wouldn’t do that. 10. Of all the places you have sailed, is there one that keeps calling you back? I know it's almost impossible to ask "what is your favorite" - but...do you have a favorite destination? Amanda: The Azores – they are so fresh, small and romantic. We really love and are drawn to isolated, small offshore islands and the very interesting people we find there. Some examples: the Aran Islands off the west coast of Ireland, Norway’s Lofoten Islands, the Shetlands, Chiloe Island in Patagonia and the tiny, isolated islands of the South Pacific like Mopelia. John: I would add Vanuatu and Fiji for the islanders infectious zest for life and crazy sense of humor and Antarctica and Spitsbergen for the 24 hours of daylight mid-summer and how everything seems like it is in 3D and larger than life. Want more of the Neals? John and Amanda will be presenting at the upcoming Chicago, Seattle and Vancouver boat shows. Sign up for their in-depth full-day seminar on Offshore Cruising (which covers 18 topics and includes their 260 page cruising companion) or check out their smaller free seminars on everything from storm tactics to outfitting. Check out John's book Log of the Mahina - A Tale of the South Pacific about his journey to the South Pacific. All photos used in this post are by Tor Johnson and used with permission. Great read, Brittany! The Neals are icons in the Seattle area and it was interesting to hear their take on how not to get burned out. We've been living-aboard and cruising for 13 years but always take land-break to visit family and friends. Like them, we come back to the boat feeling refreshed and ready to dig in!